In this The Thrill is Gone Lesson, Guitar Control Instructor, John Maclennan is going to explain how to play this B. B. King classic. John is going to focus on only a few of the licks from this song today, and give you a step by step rundown and breakdown of a few of his favorite licks from this awesome song. Remember to really pay attention to detail and also to take any of the licks you learn and throw them into your bag of tricks. You can also take it one step further and use them to write your own! This is a great, slow blues track in the key of B minor. The first step in this The Thrill is Gone Lesson is breaking down these iconic licks. Lick one starts with our pointer finger holding down the 7th fret 2nd string, add lots of vibrato to this note. Then he goes up a string to the 7th fret 1st string also using his pointer finger to hold that note down, and then goes straight to the 10th fret 1st string with a slight bend and then back to the 7th fret 1st string. Then go to the 2nd string 10th fret, use your ring finger to hold this note down and pick it. Then you are going to use your second finger on the 9th fret 3rd string and bend it up a whole step. Then pick the 7th fret 3rd string twice, holding it down with your pointer finger, and then go to the 3rd string 9th fret with your third finger and pick this note once, then right above to the 4th string 3rd fret to end this lick, holding it down with you second finger. And lots of vibrato on this bluesy lick. 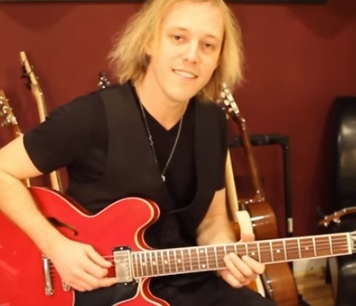 In this lick and anytime you are playing the blues, well any time you are playing anything, but the blues especially, try to keep the mindset of trying to make your guitar sing. After all of that go to the 7th fret 3rd string and bend it slightly using your pointer finger, then to the 9th fret 4th string and pick this note three times with lots of conviction. See the video at the 1:19 minute mark to see John play what we have so far. If you are enjoying this B. B. King classic, make sure to check out our other lead guitar lesson how to play Kenny Burrell licks for some jazz blues licks you may also want to add to your repertoire. Then after all of that, you are going to go back up to the 7th fret 3rd string with your pointer finger, then go to the 9th fret 3rd string and bend with your ring finger, while this note is bent you are actually going to place your pointer finger back down on the 7th fret and “smoosh” it down, barring it across the 7th fret covering the 1st and 2nd strings. Then pick them individually starting with the 2nd string first and then picking the 1st string. Then pick the 7th fret 1st string twice, with tons of vibrato. Like actually going crazy with it. Watch John play along to everything we have done so far the 1:46 minute mark. To get more of a B. B. sound John recommends hammering all of the notes with a downstroke. The last lick is just a bend on the 10th fret 1st string with your third finger. It’s a whole step bend, bend and release, which means you bend it up and bring it back down, then pull off to the 7th fret 1st string holding that note down with your pointer finger. Go to the 2:34 minute mark to hear John play the entire thing slowly. Feel free to play along with him if you can! I hope you enjoyed our The Thrill is Gone Lesson! Many people consider B. B. King to be the king of the blues and I’m sure after listening to him and learning some of his licks you can see why. Every note matters, and every note is emotional, thoughtful, and tells something. Use this as inspiration to do the same. To use your guitar to communicate and to tell a story. To make your guitar sing. That is where the most powerful guitar playing comes from. So take these licks and make them your own, put your own feel and emotion into them and see what you can come up with. And of course, as always, have fun!